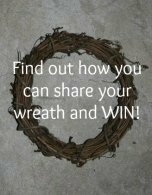 Edible wreaths are fun and although they do not last very long… they are pretty, practical and make GREAT gifts. You can send one of these to your college student to let them know you are thinking of them and supporting them during finals. I made two, one for my son and one for my nephew who are both off at school. They both were really surprised and enjoyed them down to the last piece of candy. It was also a quick and easy decoration for their apartments. Easy Halloween decoration for a guy. Although they do take a little time to make, they are easy, very pretty and well appreciated. 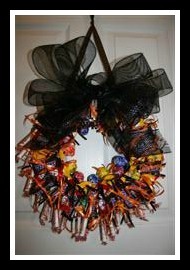 You can design your wreath and pick out candy to fit a particular color scheme. You can use all the same candy for a particular look. Or if the person you are making it for has a favorite candy this can be the main focus. 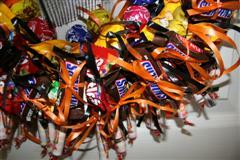 Ribbons to tie on the candy and a bow to accent in can be coordinated into the design as well. Edible wreaths can also be made for birds and squirrels. Edible wreaths can be made for our feathered friends. 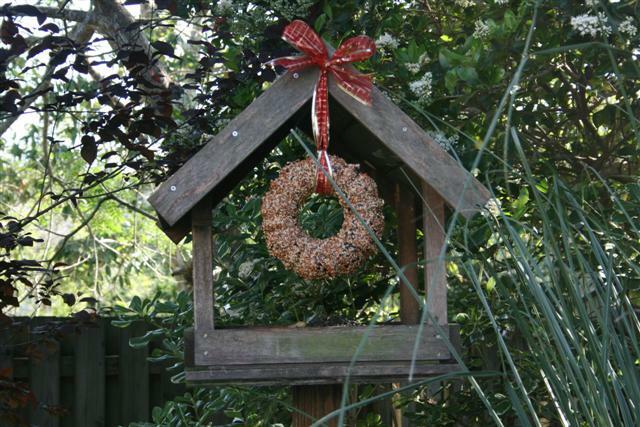 A birdseed wreath will not last long, but the birds will love them, and for you bird lovers it will provide a great bird watching experience. These can be made in a mold with loose seed and gelatine or from stalks of dried seed. Birdseed wreath hanging on the bird feeder. 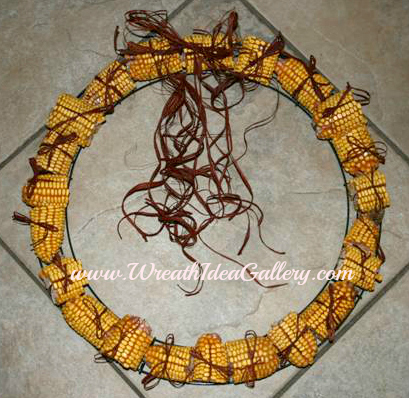 Anyone made a corn cob wreath? A corn cob wreath will intrigue the squirrels, and make for some great entertainment as they enjoy their afternoon snack. It did not last long but my squirrels loved their wreath.